I'm recovering from surgery in the hospital. They took out my stomach (and spleen and part of my pancreas which I guess is no big deal) and I'm healing well. 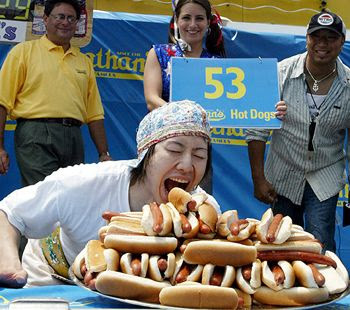 Tony, Kim, Maple and I watched Nathan's Hot Dog Eating Contest yesterday for July Fourth on ESPN. at least your taste buds are safe. so happy to hear your doing well!